These are really easy, healthy and great for packed lunches or just a simple protein pick-me-up! Blend all of the ingredients together using a high powered blender or food processor. 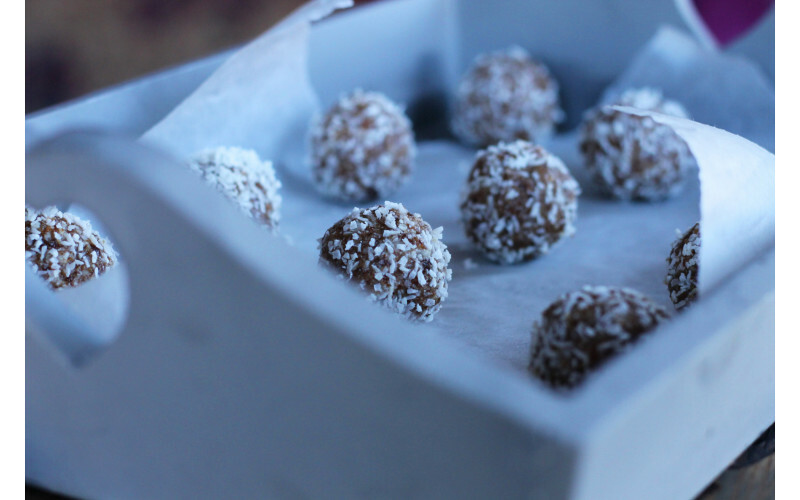 Form into small energy balls and then dip into a bowl of dessicated coconut to cover. Place in an air tight container and keep in the fridge. They should keep fresh for a week. Did you know that Vegan Recipe Club is run by a charity? Viva! is a UK-registered charity which educates people about the realities of factory farming and how it impacts our health, the planet and animals. Vegan Recipe Club is part of our project to make going – and staying – vegan really easy by providing amazing recipes which make even meat-eaters’ mouths water! We’re doing it because veganism saves animals, protects our planet and is better for the environment and your health. We don’t receive any government funding. We can only keep going with YOUR help. Please consider donating to Viva! to help us continue to offer these life-saving services. Over 100 delicious recipes for any occasion.